Cats may be shy and skittish for a variety of reasons. For example, if you chose to adopt an adult cat from a rescue shelter, it may have experienced some harsh treatment in its younger years. In other cases, a cat may have not been exposed to many other people or animals during kittenhood, and this lack of familiarity may have bred feelings of fear. However, other cats simply have more cautious and reserved personalities. Whatever the cause of your cat's anxious nature, here are some thoughtful things that you can do to help. When you invite people to your home, make sure that they know you have a scaredy cat living under your roof and ask them to behave accordingly. In particular, new people should not approach your cat, but rather allow the pet to approach them. If your cat is generally receptive to new people but tends to be cautious upon first meeting, suggest that visitors get down to the cat's level in order to look less imposing. It may also be worth letting them know that cats typically don't like direct eye contact and that actively avoiding eye contact will help the animal feel more confident. Finally, consider bribery! Cats might respond more positively to guests if you provide treats for new people to give to your pet (or encourage coaxing your pet out with a new toy). If you have an indoor cat, it's possible that your pet will feel trapped when there are frightening new people in the house. In fact, a very shy cat may even feel uncomfortable if it seems that there is nowhere to escape you or other family members. 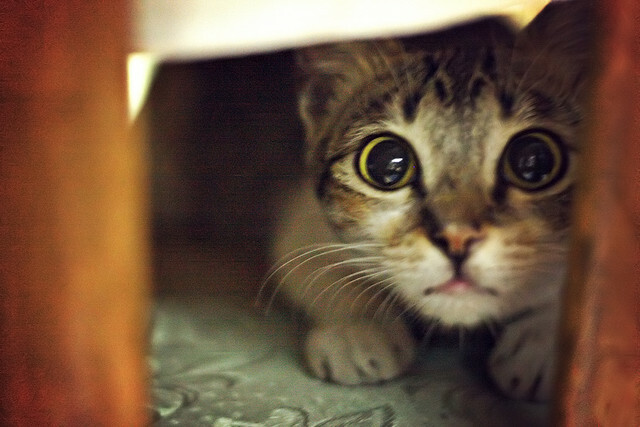 It's a good idea to allow your cat to reach quiet, safe rooms and to provide lots of hiding places for sleep and rest. If you know that your cat feels terrified when guests come to your house, consider shutting your cat in a room far from the noise and bustle. However, make sure you provide food and stimulation (such as favorite toys), and keep the room at a comfortable temperature. It's very important for your scaredy cat to know that you are not threatening and that you won't try to force any unwanted interactions (except in necessary situations, such as when you have to visit the vet). Let your cat come to you rather than scooping the animal into your arms, never chase your pet if you notice the cat seems shy or anxious, and don't shout or scold if the cat does something that displeases you. All of these friendly, reassuring behaviors let your pet know that you are trustworthy and kind, and in some cases forming a close bond with just one person will open the door for closer relationships with other humans.